Was it a devastating, soul-crushing loss? Or was it just a frustrating but minor bump in the road? Peter Davis/Special to the Pahrump Valley Times Pahrump Valley football coach Joe Clayton firmly believes his team has already forgotten about its tough opening loss and will be fired up to play against Virgin Valley in front of the home fans. Peter Davis/Special to the Pahrump Valley Times Casey Flennory, shown with a 33-yard reception last season against Western, rushed for 147 yards in Pahrump Valley's opening game against Lowry. 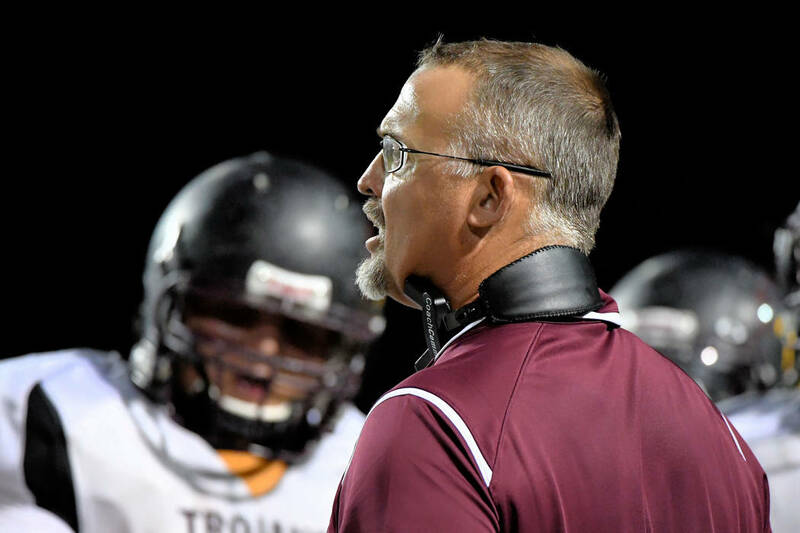 The Pahrump Valley High School football team did not get off to the start it had expected, with four turnovers negating the best offensive performance anyone around the Trojans can remember in a 41-40 loss to Lowry. The details make it seem even worse. The Trojans blew a 32-13 lead, and the winning score came in the final minute of the game after the last of those turnovers. There’s no happy way to spin that. It was brutal. Adding injury to insult, at a time when the Trojans should have been running out the clock, instead they had a player get hurt on the Buckaroos’ tying touchdown. So much for the “icing the kicker” theory. Clayton said Caleb Sproul also suffered a concussion during the game, stretching an already-thin roster even thinner. If the Trojans can recover mentally in time for tonight’s home opener against Virgin Valley, the only thing that will matter about the loss will be the injuries. Clayton believes they will. The support of the home crowd can make tonight’s game feel like the “real” opener. Not to completely dismiss what happened in Winnemucca, but in the end it does not matter. All of the Trojans’ goals are still on the table, and Clayton firmly believes his players get it. “I told the boys right away, right after that game, that this has no bearing at all on our league play,” he explained. “They understand. It’s not that it doesn’t matter. I told them, ‘If you’re hurting right now because of this tough loss, it obviously mattered.’ But in the big picture, when it comes to playoffs and league competition, it means nothing. Football coaches, as a rule, are not known for nuance. But Clayton has drawn the line exactly where it needs to be drawn: It was a brutal, devastating loss, but it doesn’t mean squat. It makes no sense, yet it makes perfect sense. It’s simple. In many sports, you might play two or three times a week, more often when there are in-season tournaments or games rescheduled because of rain. Football is once a week. For an entire week, players prepare for the task at hand, totally focused on beating that week’s opponent. Defeat, especially one such as the Lowry game, hurts. And it hurts bad. But for making the playoffs, for trying to play for a Class 3A state championship, it is entirely irrelevant. Only your league games count for playoff seeding. It’s unlikely to happen, but in theory a team could lose every non-league game, go unbeaten in league play and be a top seed in the playoffs despite a mediocre overall record. That is not the Trojans’ plan, of course. But it does put the opening loss in perspective. Getting back on track starts tonight against Virgin Valley, and motivation won’t be a problem. Aside from having a vocal crowd behind them, the Bulldogs began the year as the top-ranked team in Class 3A South. And it was Virgin Valley that eliminated Pahrump Valley from the playoffs last year. Who: Virgin Valley (1-0, 0-0 Class 3A Sunrise). When/where: 7 p.m. today, Aug. 24, Pahrump. 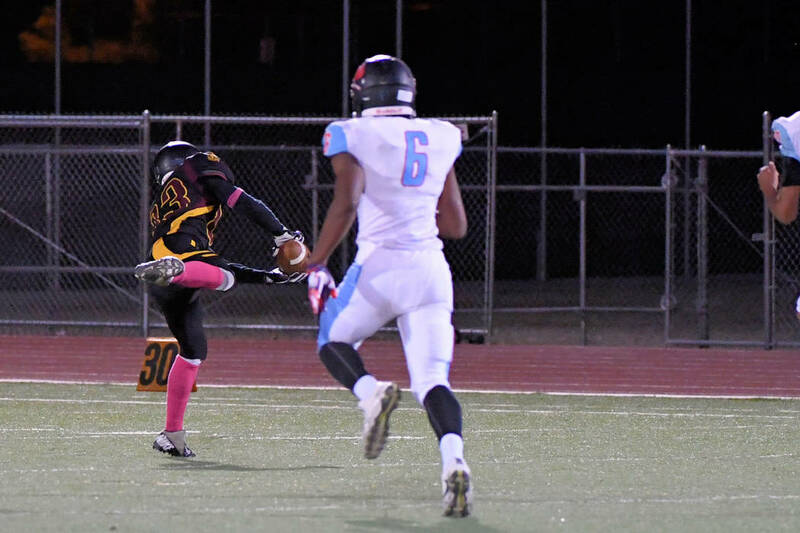 Last week: Virgin Valley defeated Clark 28-20; Pahrump Valley lost to Lowry 41-40. Next week: Del Sol at Virgin Valley, Sunrise Mountain at Pahrump Valley. About the Bulldogs: Virgin Valley figured to have a dramatically different look this year after losing all-everything Jayden Perkins to graduation. Perkins rushed for 1,880 yards and 24 touchdowns last season, while racking up 705 yards and seven touchdowns receiving. He also led the team in tackles with 47. But the Bulldogs didn’t play their opener as if they were waiting for Perkins to make a play, beating Class 4A foe Clark, a team that crushed them 49-26 a year ago. Wyatt Delano, who had four carries all of last season, rushed for 109 yards and two touchdowns against the Chargers, while Tanner Fielding rushed for 89 yards and quarterback Meb Hollingshead threw for 102 and rushed for 59. All three players are juniors. The Bulldogs went 7-4 last year, losing in the second round of the regional playoffs to Mojave.